Bear hunting Alaska bound on the trip of your dreams to take part in some world-class hunting. You’ll have the opportunity to take part in several species of bear. Alaska offers 5 species of Alaska big game to hunt including brown bears, and Grizzly Bears. For your incredible bear hunting Alaska trip you will want to make sure you stay at a place that provides not only super trophies, but also a fair chase. Your trophies should include the higher end of animals hunted, and with some luck you can find an outfitter that will help you consider color and size. You’ll then leave with filled-out tags and an outstanding trophy of the best of the best Alaska hunting trip you’ve ever been on. Before you leave home, make sure to practicing shooting from a standing position. This is not only important, but it is what you will need for success on your Alaska bear hunting adventure. Bear hunting Alaska clients can expect to take bears in the 8′ to 9′ size range with skulls from 24″ to 28″. Each year the sizes do vary, but this will give you an idea of what to expect on your bear-hunting trip. The best location for your trip is near the coast of Bristol Bay, considered world record bear country. Bristol Bay trips are all in remote wilderness more than 200 miles from the closest part of the connected North American road system. Great country to be tracking bear in and superb opportunities for taking pictures of a lifetime of you with your trophy bear. 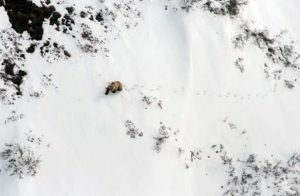 If you’ve got your sites set on bear hunting Alaska brown Bear, then you’d want to be booking your trip for the Spring. This time of the year offers prime hides, dense fur with long thick hair and heavy claws. If you don’t make it in the Spring, you still have a long season to take advantage of and a lot of bears. The length of the brown Bear season is almost 8 months, from September 10th to May 25th. 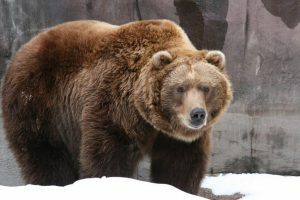 Brown bears are found all through Alaska with one exception, the islands south of Frederick Sound (southeastern Alaska), the islands west of Unimak, and the islands of the Bering Sea. At one time brown bears and Grizzly bears were listed as a separate species. However, they are actually the same Ursus arctos. There is one area in Alaska (Kodiak Island) where the browns are a distinct subspecies. The shape of their skulls differ slightly and they are physically isolated from the main gene pool. Amazingly, brown bears have an approximate life span of up to 34 years in the wild. This is thought to be a rare event. Males may reach the age of 22 years, females 26 years. Since you may be hunting brown bears be aware they have an excellent sense of smell and under the right conditions can detect odors more than a mile away. Although related to the black bear, you likely won’t miss a brown if you see it. But pay close attention, because typically you cannot distinguish them by color alone (Browns range from dark brown to light blood. Other distinguishing factors for a brown are: they’re bigger, have larger shoulder humps, smaller ears and the claws are longer and straighter. By the way, the hump and the claws are adaptive to their feeding behavior. As with most species of bears, their weight will fluctuate depending on the time of year. So, if you expect to take part in tracking several species and find the ultimate size trophy while bear hunting, Alaska offers you the best variety. And even though you are there to go bear hunting, Alaska offers some of the most stunning scenery anywhere. Take your camera!